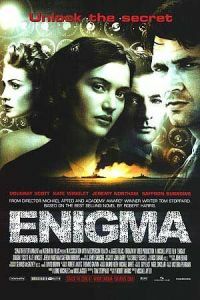 This film is a drama that is set in the World War 2 British code breaking centre at Bletchley Park. It is a mixture of spying and romance that is set against the background of trying to crack the German Enigma code and its significance for the allied war effort and the protection of the transatlantic convoys. When Dougray Scott's girlfriend (Saffron Burrows) goes missing he enlists the help of her best friend Kate Winslet to find out what happened. The plot is entirely fictional, but there is much in the film that reflects what life was like at Bletchley Park and the work done there in breaking German cyphers. There is a good performance from Kate Winslet and some good supporting performances.